The articles below were written at different times and show how my construction methods evolved slightly in the light of experience. Page updated 22nd April 2005 with latest entries at the end of page. About a year ago I joined the S Scale MRS, having been casting around for a branch of our hobby that was more individualistic than the type of modelling that I've been doing for the last few years. This has, admittedly been somewhat varied, but apart from my 21mm gauge Irish diesel layout, most have "followed the crowd' to some extent. There has been an East German TT scale layout, as well as several large N and HO Scale Austrian and West German layouts fall based closely on actual stations with scratch built structures and modified stock). More recently I've returned to mainstream British 4mm modelling with a layout based on Wennington on the Leeds to Morecambe and Camforth lines. This was intended as a glorified test track for my kit-built 00 gauge locomotives and stock. The current follow-on project is a more grandiose layout based loosely on Hellifield; this will fulfil an ambition I have had for over twenty years to model this North Yorkshire junction in the 1960s. As you will now realise, I have wide interests and tend to build layouts and models fairly quickly. The above have all been built in the last 15 years. Nevertheless I have often felt that none of these projects have quite expressed me as an individual modeller. Two things happened to propel me to take my first tentative steps towards S Scale modelling. Firstly I read David Jenkinson's 'Carriage modelling made easy'. His detailed descriptions of building carriages inspired me to think, 'I could do that'. 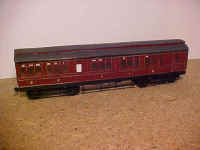 However, I've also dabbled in 0 Scale- Jannick Midland coach kits and an Alan Gibson 2P were built and then sold! The problem with 0 Scale for me is simply it is too close to heavy metal work and I don't find that relaxing after teaching a class of nine and ten year olds all day. The second prompt was seeing Alan Gibson's offerings of Midland loco, wagon and carriage in S scale in his catalogue. Perhaps building carriages using David's methods and Alan's kits would be a new way forward. Out came my Midland carriage drawings and a Clayton bogie parcels van was selected. What I did next was probably not quite what David would have done, as I don't really like Plastikard as much as he does. For me cardboard is a delightful, cheap and natural material. So in a fit of enthusiasm I spent a Saturday afternoon transferring the panelling from the drawing onto good quality thin card, pierced the comers with a pin held in a pin chuck and very careful cut out the tracery of the raised beading. I found that with care I could cut these to no wider than 1mm and that only in a few places did I break though the narrow strips. I then carefully glued the beading onto another thin piece of card using PVA white adhesive. I left this for a few hours to set and then repeated the process to cut out the five windows on each side. The following day I tackled the other side. Next, following David's description I built up die inner core of the body with spacing strips to allow the insertion of the glazing after painting. It's necessary to remember to paint me inside of this box black before you seal it up otherwise the inside walls will appear to be the colour of die card. The outer sides of the carriage were then glued to this inner core and one end fitted. The tumblehome of the sides and ends are catered for by strips of card glued to the inner core above the waistline of the carriage. One outer end of the body was left off and is not fitted until after painting and insertion of glazing. None of the above is in anyway original and I can only recommend that you read David's book (or Norman Pattenden's submission in the S Scale Handbook — as well as being cheaper, yon get lots of other articles tool - Ed). However, I feel that with the next stage of construction, the roof, I may have something useful to say to S Scale modellers. I first thought I would have to build up the roof out of wood, but being a lazy modeller I thought there must be an easier way. 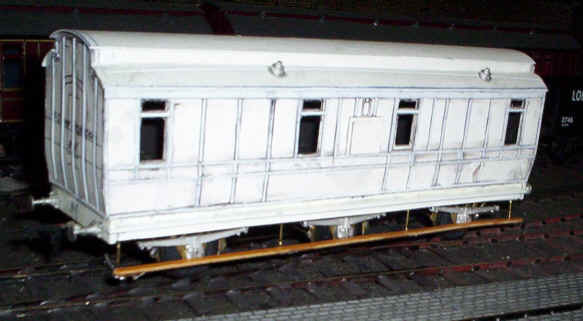 Lurking in die loft was an unbuilt Comet LMS coach kit with an extruded aluminium roof. It was obviously too narrow even for Midland stock, but the thought occurred that I could make a new and wider roof by overlaying the original with cartridge paper. What I did is described below and since the model has been in existence for over a year, with no sign of warping to the roof, I feel I can recommend my method. First, I soaked a piece of cartridge paper in water and then laid it on to die aluminium roof wrapping the edges tightly underneath the long edges. Next I liberally applied PVA glue to the wet surface of the paper, and added a second layer of wet cartridge paper on top. A third layer was added and coated with PVA. The paper was pressed down hard onto the aluminium and finally attached to the underside of the metal with parcel tape to hold it firmly in place. I then left the paper to dry overnight. Next the, now over width, paper roof section was marked out to produce two outer and one middle section (for the clerestory roof). The paper was cut carefully where it folded over under the edge of the aluminium and then longitudinally to produce the three sections of the roof. Suitable support strips were fastened to the top of the inner body core to support the paper roof and the whole lot glued together. The resulting solidity of the roof, together with its ease of construction surprised me. For the chassis I decided to use 40 thou Plastikard as a false floor with further strips attached to this to produce the solebars and footboards. The bogies are MJT 4mm etches regauged to S Gauge and tile wheel holes filed out to accommodate the Mansell wheels from Alan Gibson. Following his suggestion, I also used Ratio 4mm bogie sides. I realise these are slightly under scale, but please remember that tills was an experiment to see if I could produce something in S Scale relatively easily and cheaply. The foot-boards and bracing in between the bogies were soldered up out of brass wire and copper clad 4mm scale sleeper strip and glued on the underside of the chassis. A few details, such as buffers and gas light tops were added using Ratio parts. The whole of the body was then painted with Humbrol sanding sealer and then spray painted with grey car primer and finally Midland Crimson Lake. To line the coach I used a gold roller pen (from WH Smith), with a thin black line down the centre drawn using a fine Staedtler overhead projector pen. Well was it worth it? Yes, without a doubt, as I managed to produce a model, which, to my eyes at least, is realistic and most definitely unique. Above all it was great fun to make and has probably given me more satisfaction than any other model that I've built. Where do I go from here? Well, Hellifield will have to be finished, but there is an Alan Gibson 4F under construction and a mineral wagon completed. A few more Clayton carriages, a couple of dozen wagons and a Midland 2P would give me the basis of a nice Midland layout. Who knows what will happen. Since my last contribution to the newsletter (how to motorise a M.R. 4F with a converted Airfix tender drive unit) I’ve been pursuing my S Scale ideas further. As a modeller with no particular engineering skills and few tools beyond the normal 4mm scale necessities (my mini-drill is my own machine tool), I find many of the admirable ideas in the handbook and newsletter beyond my level of competence. I prefer to adapt wherever possible, with methods that may make some people wince. I’m sure I could learn how to drill a chassis accurately if I had to but, somehow, at the end of a long day teaching recalcitrant primary school children, it’s too much!! So here are a few more of my “bodger’s” S Scale projects. Members may recall my short article about building a M.R. 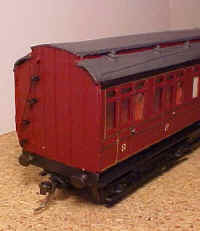 Clayton bogie parcel van, principally from card. 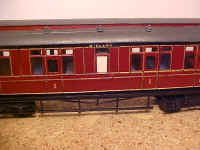 Well it now forms part of a four-coach rake of similarly built passenger carriages. I wasn’t sure whether the idea of using card for the much more intricate sides of compartment stock would work; all those holes for windows must surely weaken the sides significantly. I wasn’t too enamoured, either, about the thought of all the marking out necessary to produce the sides. Then the idea of using my photocopier, which can adjust the size of the printout, occurred to me. A photocopy of a side from Jenkinson’s “Illustrated History of Midland Railway Carriages” was made and copied on to thin white card to produce a side of the required size. Pricking holes at each corner with a sharp compass point, followed by cutting out the resultant holes quickly produced a plain side. Well, at first I though this would be a problem. Initially I scanned the original drawing on my computer, and converted it to a mirror image. However, I felt that the distortions produced in the process and the slight lack of clarity would be a problem, so I adopted a much simpler solution. Take a second photocopy, prick the holes, then turn the sheet over and cut out the holes from the opposite side. Then trim the side to the finished side and using the window holes as a guide it is surprisingly easy to apply the micro strip in the correct place. Be warned, however, on one of my coaches I have a guard’s compartment window in the wrong double door, because I didn’t check the window openings for the double doors on the vertical plan! However, I didn’t notice this until the model was finished so I’m afraid the fault will just be ignored. The coach was then fitted with an interior, made of card naturally. The compartment partitions contribute considerably to the rigidity of the final model . Before proceeding to add the roof the interior has to be painted . I choose to paint the 1st class in blue and the 3rd class a dark red. The roof was then added using exactly the same techniques as described in my first article; moulding layers of wetted and glued cartridge paper over a Comet aluminium coach roof , and then cutting to size so as to make the correct clerestorey roof. The coaches built using this method have now been in existence for over a year, and show no sign of warping. Since they’ve been stored in a variety of locations, ranging from over 80 degrees, down to the low 30s, I’m reasonably optimistic that they will stay in this condition. The three carriage models were now ready for painting and I used exactly the same method as for the parcels van; an oxide brown spray primer, followed by several coats of Railmatch BR Maroon – it’s close enough to Midland Crimson Lake as far as I’m concerned. Before painting I pushed strips of card through the glazing slots so as not to spoil the already painted interior. Lining was done in two parts; first the gold marker pen that WH Smith’s sell was used to represent the straw colour and then a black line was drawn down the middle using an very fine overhead projector pen. For lettering and numbering I have used 4mm scale transfers. After spraying with satin varnish the glazing strips were then pushed into place and the removable end secured in place. One last problem remained that defeated me for some time, and that was how to affix the distinctive end steps. These obviously had to be metal for strength, but how was I to attache them to my card bodies particularly as, by now, the models were fully painted? In the end the solution was simple; I cut some small squares of nickel silver from a valve gear fret, and soldered on a length of brass wire with about 5mm of wire extending beyond the square. Next I drilled a small hole through both the outer and inner end of the card body. A little epoxy was smeared on the wire and the wire was push through the holes and allowed to set. Likewise the step handrail was made from wire with about 6mm bends at each end. The wire was pressed through holes drilled in the card and secured with a smear of epoxy. The only disadvantage of this method is that if I ever need to replace the glazing I shall have to remove one of the coach ends, as it is no longer simple a loose fit. 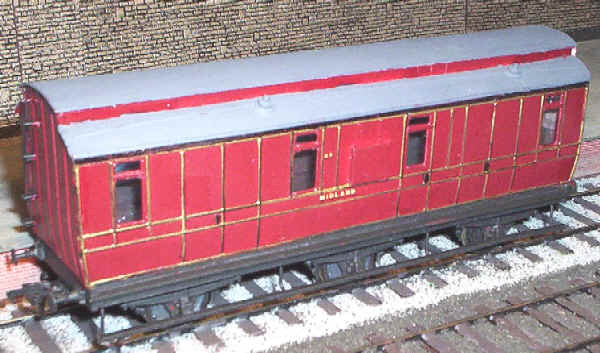 Originally, for my parcel van, I used the Ratio 4mm scale Midland Railway bogies attached to MJT etched brass bogies, widened for the S Scale gauge but without altering the wheelbase from the 4mm scale 10’ of 40mm. However, with the slightly longer passenger stock they looked far too short so I bit the bullet and altered their length to the S Scale equivalent of 47mm. The method I used will probably make some member’s hair stand on end but it works, takes about an hour to do for each coach, and allowed me to make progress which I probably wouldn’t have otherwise. Take the original bogie frets (there are two of them) and snip off the ends of the frame-sides which have the wheel bearing holes in. These now have to be soldered to extension strips of brass attached to the bogie frets ensuring that the holes are the correct distance apart and everything is still in a straight line. I made a simple jig of a piece of wood and some panel pins set at a distance of 47mm to do this. The bogie halves and pivot are then assembled exactly as MJT intended. To finish the brasswork, I solder some more brass strips to the top of the bogie-halves but behind the wheels. Next I soldered on U shaped pieces of wire to hold the ends of the bogie side frames in line and make it impossible for the wheels to inadvertently drop out. 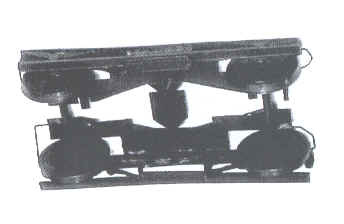 The Ratio bogie sides are then cut into three parts, so that the section with the axleboxes also has the diagonal and vertical struts attached. I discard the middle section. The two outer parts are then secured to the brass using two-part epoxy, ensuring that the top of the bogie sides line up. When set, the gap in the middle can be filled with pieces of plasticard cut to size. To complete, I cut a strip of 40 thou plastic 63mm long and attach to the underside of the axleboxes , The bogies can then be spray painted and attached to the press stud pivot point which has already been glued to the coach base. The latest addition to Halifax Midland's rolling stock is this Full Brake. The chassis utilises the S Scale Society's etching for a Cleminson type 6 wheel underframe. I found this amazingly simple to construct; the vehicle runs smoothly on Alan Gibson Mansell wheels. This underframe unit is attached to a very thick piece of Plasticard which is the glued to the base of the vehicle's body. The footsteps are made from N scale copper clad sleeper strip supported on brass wire brackets. The couplings are Bachmann mounted rigidly onto the chassis and work well even on my tight curves. The body is built entirely out of card and Slater's Microstrip in the same way as my Clayton bogie coaches. Still to be added are the end steps and handrails.